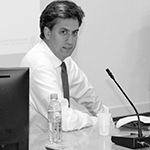 Former UK Labour Party leader Ed Miliband on "Brexit"
On October 7th, 2016, former Labour Party leader Ed Miliband visited Sciences Po to speak at a MaxPo-sponsored event on "Brexit", or the UK's exit from the European Union (EU) following the referendum that took place there in June 2016. To a packed and engaged audience of mostly students, Miliband spoke about three main points: 1) Why Brexit? ; 2) What the Labour Party should do now; and 3) Brexit's wider implications. Miliband began his talk by commenting on "the enormity of the vote in terms of Britain's place in the world," and he noted that the whole of the establishment — be it politicians, economists, business, trade unions, the international community, scientists, etc. — supported the "Remain" vote, which was, in fact, the expected outcome. The overall result of 51.9 % to leave the EU vs. 48.1 % to remain, with a 72 % turnout rate that far exceeded expectations, was thus a highly unexpected outcome. Miliband stated that the referendum outcome was a "deep, profound vote," and that "it was not a nasty accident." According to the politician, the gloomy public sentiment would have otherwise manifested itself even if a referendum had not been called, and the vote was mainly an expression of two core things—class and identity. The vote was about defying the establishment and the political elite; it was a disgruntled expression of economic disenchantment. In fact, many people felt that they had nothing to lose, and as one woman put it, according to Miliband, she voted to leave the EU because she wanted a "new beginning for my grandchildren." In other words, those who voted "Leave" thought that life quality had deteriorated over time, whereas "Remain" voters did not. "Take back control" was the lasting refrain of the Leave camp. Miliband maintained that the "winners" of globalization voted to keep things as they were, but the "losers" voted to take a risk and to starkly deviate from the status quo. Miliband offered his vision of "Where to go from here," maintaining that the referendum result must be accepted, since a refusal to do so would only make matters worse. It would exacerbate negative public sentiment if elites did not heed the vote's result, when the original critique manifested by the vote was that elites do not listen to the people. Miliband advocated for a "fair Brexit," which should avoid "doing serious damage to the economy." He stated that "the UK is more powerful because of the European Union," and that how much the UK will work with Europe remains an "open question." He went on to say that "Europe will be much stronger if Britain can still be a part of its orbit," due to shared values and trade with the continent. Miliband ended his talk on a positive note, offering an optimistic vision for the future: "The task of progressive politics today is to not succumb to gloom!" We are now in "uncharted territory," which is "not a great divorce," but rather, we have reason for hope. There is now a bigger chance for a "multi-speed Europe," and there are key issues that unite, rather than divide, the Remain and Leave voters, such as "quality of work, housing, and children's chances in life."